Owned and operated by Michael Luke and Sarah Joy Stoker Pony Locale is a fully certified Pilates, Kinesiology and Massage Therapy Studio, specializing in high performance training, restoration and rehabilitation. The emphasis and philosophy are on functional movement and strength based on sound mechanics and a clear understanding of how the body works and moves. Owners Michael Luke and Sarah Joy Stoker have over twenty years of experience between them working in the fields of physical training, movement and rehabilitation, and are two of the most respected and sought after movement educators in St. John’s. Along with their staff of highly trained and experienced Kinesiologists, Exercise Physiologists, Pilates instructors and Registered Massage Therapists, Pony Locale offers an exceptionally effective range and breadth of knowledge and expertise. The studio offers private and semi private training/conditioning sessions, group Reformer classes, dynamic Pilates and Core Conditioning classes for multiple levels, and Restorative classes designed for people with chronic pain, injury and or low bone density conditions including Osteopenia and Osteoporosis. Also available are Neuro classes designed for people with Multiple Sclerosis, Parkinson’s, Stroke and brain injury, along with other pathologies or conditions. The work of Pony Locale promotes movement with assurance, freedom and power. Through focused, diligent, patient practice, there will be relief of pain and tension, and an overwhelming feeling of strength and confidence in your body and its ability to support itself. This work trains and conditions the body, brain and nervous system for optimal movement. When we move optimally it is without pain or discomfort, it is with power, strength, confidence and ease. To achieve this we must develop an active relationship and dialogue between body and brain incorporating all aspects of our physiology. The brain and nervous system control movement, conscious and unconscious. Only with an active and stimulating interplay between physical body and brain can we achieve the results we want in our health. Michael, a Certified Kinesiologist with the NLKA, was born and raised in St. John’s. He possesses a Bachelor of Kinesiology from Memorial University (2004) and studied Athletic Therapy at Mount Royal College in Calgary, Alberta (2005-06). He has studied with Thomas Myers, http://www.anatomytrains.com, and is working towards certification as an Athletic Therapist. Spending much of his life involved in sport, Michael took a keen early interest in injury prevention and rehabilitation. Using rehabilitative techniques, including Soft Tissue Release, as well as his 10 years experience working in the fields of health and wellness, Michael ensures that through his unique, challenging and exciting approach to movement, he helps clients and patients reach their goals as well as enhance both their performance and quality of life. Michael’s personal mission is to provide the absolute best service to others, to set high, achievable standards for himself and to offer what he can to help and support his community. Michael completed the Body Harmonics Mat work Pilates level 1 certification spring 2017 and the Body Harmonics Reformer work level 2 certification fall 2018. A St. John’s native, Sarah is an accomplished professional contemporary dance artist (gutsink.nf.ca) with over 20 years of professional experience, performing nationally and internationally, since graduating from the School of Toronto Dance Theatre in 1996 . One of the first to teach Pilates in St. John’s, Sarah is one of only a small number of fully certified Pilates Instructors in the Province. After ten years of independent and contract teaching she opened her own Pilates studio, Pony Pilates, in 2011 and since 2013 co-owns and operates Pony Locale with Michael Luke. Sarah has trained with internationally renowned movement, Pilates and anatomical educators, Margot McKinnon (Founder of Body Harmonics,Toronto), Thomas Myers, anatomytrains.com, and Elizabeth Larkan, pioneer and innovator within the international contemporary Pilates community. Her lifetime of dance and innate sensibility and understanding of bodies and movement make her a gifted facilitator of body and movement education. Ongoing for almost a decade Sarah has been studying Pilates Teacher Training, post rehab, specialized anatomy and bio-mechanical protocols and work with diverse populations at Body Harmonics in Toronto, the internationally acclaimed Pilates Teacher Training Facility, and she has recently become the first and only affiliated teacher trainer for Body Harmonics east of Quebec. 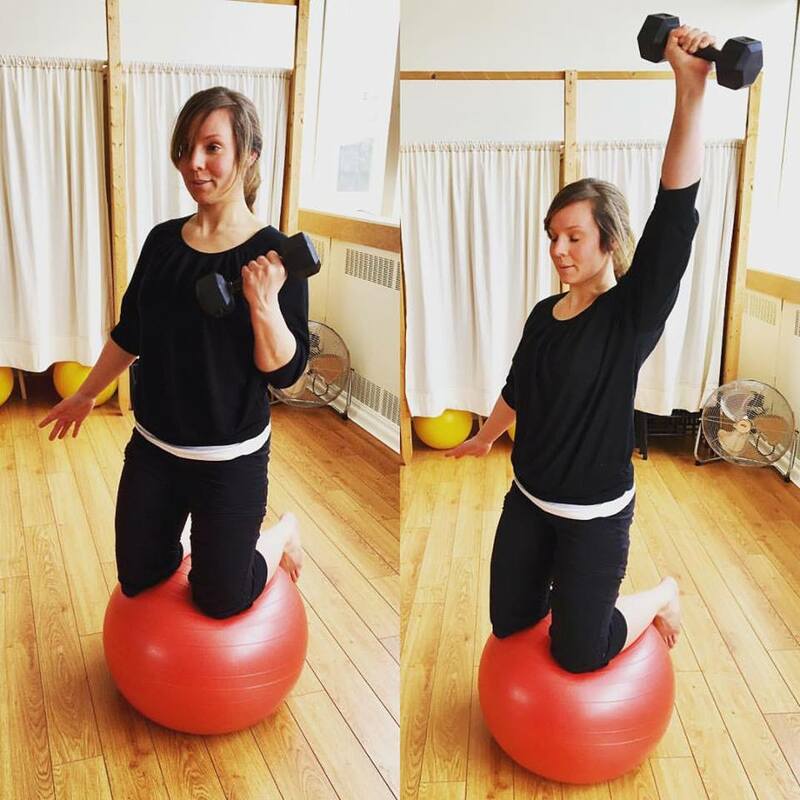 Sarah distinguishes herself as one of the few Pilates Instructors in the City and Province that has “Soft Tissue Release” certification, a vital tool in full body maintenance as well as rehabilitation work. Sarah is also trained and experienced in working with people with neuromuscular conditions as well as bone density issues like Osteopenia, Osteoporosis and Osteoarthritis. Holly was born and raised in St. John’s, and was introduced to Pilates in 2002. Instantly she fell in love with this special form of exercise, which led to a career in health and wellness. She began teaching in 2003 with the University at The Works, and the YMCA. In 2005 she became a mom, and continued to train and take class. Her infatuation for movement mechanics and helping others achieve physical barriers grew and grew. In 2007 Holly began massage therapy training in St. John’s. She excelled in the program because of her Pilates experience. After finishing the program in 2009, and becoming an active member of the College of Massage Therapist’s of Newfoundland and Labrador, Holly traveled to Toronto to study at Body Harmonics, internationally recognized and considered the most renowned Pilates teacher training centre in Canada. She is a certified Pilates Mat Work instructor and will continue her training with Body Harmonics into the future. Since starting her massage therapy practice, teaching a variety of classes, and having a second child, life is certainly busy, but her positive energy continues to shine through her classes and treatments. Holly specializes in pre-natal massage, myofascial release, and deep tissue techniques. Also available is seated massage on the specialized massage chair. Born and raised in St. John’s, Alan has a Bachelor of Kinesiology (Honours) at Memorial University. Initially intent on becoming an engineer, everything changed in 2003 with the realization due to personal health challenges that health is the greatest wealth. This realization transformed his focus and helped direct it towards helping others enhance their own health and well being. Constantly searching for new information and ways to help clients, Alan shares information and utilizes techniques from the latest quality research as well as more traditional systems such as yoga. With over 5 years of experience in the areas of rehabilitative training and ergonomics, and corporate health program facilitation, he has helped a wide-range of clients work towards and achieve their goals. Alan strives to deliver the most accurate information and compassionate service possible to clients. He believes that balance in the body is necessary for optimal health, strength and energy, and so, blends functional strengthening, stretching and myofascial exercises for a comprehensive and rejuvenating experience. Alan is currently a Certified Kinesiologist as well as a Certified Exercise Physiologist, and is working towards his Masters of Science degree in Work and Exercise Physiology at Memorial University. He lives in St. John’s with his wife Karly and enjoys an active outdoor lifestyle, hiking and playing a wide-range of sports regularly. To make an appointment with Alan please email him at alan@ponylocale.ca. Anne Troake is an internationally recognized multi-disciplinary artist and documentary filmmaker. Her introduction to body-mind training based on the work of Joseph Pilates was at Canada’s first Pilates studio, the Vancouver Pilates Centre, shortly after its founding in 1985. It was here that she began integrating the principals of classical Pilates syllabus into her practice as a professional contemporary dancer. Anne continues to work as a movement coach and has recently completed a Masters degree in social anthropology. She received her Pilates equipment certification through the Physical Mind Institute and Body Harmonics under the instruction of Susan Greskevitch and Margot McKinnon. She subsequently worked as a guest instructor at the Bermuda Health Coop and Lee Saunders Pilates. Anne’s approach to movement training is rooted in Pilates fundamentals and is influenced by her studies in Feldenkrais (Frauke Voss, Olena Nitefor), Ideokinesis (Irene Dowd) and Authentic Movement (Judith Koltai, Andrea Olsen, Tedi Tafel). To make an appointment with Anne please email her at anne@ponylocale.ca. Ashley has spent her life being active. With a history of sports, outdoor adventure, travel and hours clocked at the gym it was natural for her to be drawn to a career where she'd have to stay healthy and active herself, and promote it to the public. With the personal principal that 'it takes a village, client included', Ashley is so excited to be part of a team with a multifaceted and active approach to wellness, at Pony Locale! A St. John's native, Ashley spent the first part of her 20's heavily involved with the national youth service program Katimavik (www.katimavik.org) which had her participating, then travelling and working with youth and non profits across Canada. Most recently, a Registered Massage Therapist since September 2013, Ashley has been eager to learn, and help the clients who walk into her treatment room. As her education continues, she seeks international training and experience with Myofascial Release (John F Barnes approach) at every given opportunity. Work, getting outdoors hiking or with her canoe and getting strong at the gym, all keep Ashley growing and smiling. To book a massage with Ashley please contact her at ashley@ponylocale.ca or call 769-2161. Leah spent many years practicing yoga and completed teacher training in several styles including ashtanga, sivananda, and restorative. She started doing pilates after several persistent injuries and found that it made her feel stronger and more aware of what was happening in her body. She is drawn to the logic of pilates and its practical application and benefit to everyday movement and specialized activities. She completed the matwork teacher training with Body Harmonics at Pony Locale in 2016, and looks forward to continuing her own exploration of movement and sharing it with others. Leah also likes to run, climb, hike, ride her bike, read books, and play with food. When she’s not doing those things, she can be found in front of her laptop trying to write her PhD dissertation. Growing up in the beautiful Okanagan Valley of British Columbia, Shannon spent the majority of her youth outdoors. While continuously active in numerous forms of sport she fostered a keen interest in personal health and fitness. After high school she continued on to attain her Bachelor of Business Administration Degree from TRU in Kamloops, BC. Shannon is married with two young children whom she has dedicated the past 8+ years to raising as a stay-at-home mom. In 2014 her husbands career moved their family from BC to Anchorage, Alaska, where she took her first Pilates class. It was then that her admiration and passion for Pilates began. "I love the mind-body connection in Pilates. Slowing things down, really feeling your body in the movements, and developing an understanding of how and why the body moves the way it does. All while getting a killer work out!" In 2016 their family was again relocated here to St. John's and with her youngest in school, Shannon decided to pursue her new found passion on a professional level. She recently completed her Mat Work training through Body Harmonics and is eager to continue to expand her resume. She is excited to bring her knowledge and energy to her classes at Pony Locale, and to share with others the benefits of Pilates she so passionately enjoys.